Which is everyone, right? I suspect this is a topic worthy of a long blog series, or an entire blog on its own, but I’m too busy for that *grin* so I thought I’d jot down a few ideas I had today and then perhaps all of you will have more to add in the comments. So here are a few hints that might assist the busy to keep their gardens relatively neat and productive, and then two strategies for crop choice that might also help. Start small. If you are a beginning gardener, don’t till up that 50×100 foot patch and expect to keep up with what you plant there. Try 10×10 instead, and then expand. Or start with containers. Of course, if you have a community garden plot, the size is chosen for you, but if you know ahead that you won’t be able to maintain 400 square feet or whatever it is, get a friend to help you and share the bounty. Mulch early and often. The value of keeping bare soil covered cannot be overstated. Do it in the spring before things get out of control and it’s just too hot to push wheelbarrows. Expect to weed anyway. It’ll be a lot less if you mulch, but remember that it has to be done and is best done on a regular schedule. In fact, working regularly is another important principle. Put gardening on your calendar, however it works for you (but at least twice a week). If you schedule it, it’ll be much more likely to get done. And you won’t show up after three weeks and get discouraged because you appear to be growing nothing but weeds. Use support structures. I mean that literally and not metaphorically, though it’s good to have family and community support! But putting in those strong tomato cages (not skinny little stakes or flimsy wire cones) and good trellises when (or before) you put in the plants will help immensely with later maintenance. And keeping plants off the ground helps limit fungal diseases and animal raids. For tomatoes, if you know you won’t have time to prune, use big cages so they can go wild. Get vicious. Some plants just end up requiring too much fussy work. This will vary depending on your pest issues, weather, etc. If you can’t grow something without spending hours picking off bugs or treating for diseases, it may not be worth growing. Rip it out before it causes more problems, and educate yourself over the winter about solutions – or else just don’t grow it again. On the other hand, floating row covers are a great thing. I would say “worth their weight in gold” if they weighed much of anything. Okay, that’s enough, but I am open to suggestions for more basic Hints for the Busy. What follows are two possible ways to plan your garden to limit time spent dealing with what comes out of it, since overwhelming harvests are another effect of gardening while stressed. I don’t mean to call up visions of three plants in a sea of mulch – you can be minimalist and still have lots of plants – but this is your approach if you just want to feed your family from the garden and not have to deal with huge amounts of extra produce. Plan your garden so you end up able to pick something for dinner every night that you cook, with a few tomatoes left over for sandwiches, and then STOP. Don’t fill in the extra space with, oh it won’t hurt to have three more squash plants and a half dozen peppers and a small field of garlic. Plant flowers instead. Or herbs. And yes, it’s hard to do the math here, because sometimes plants are prolific and sometimes they die, and how many vegetables do we eat anyway? But after a year or two you’ll get the hang of it, and meanwhile you can share your extras with friends and neighbors (who will not yet be sick of you bringing over that extra zucchini or five) or donate them to the hungry. 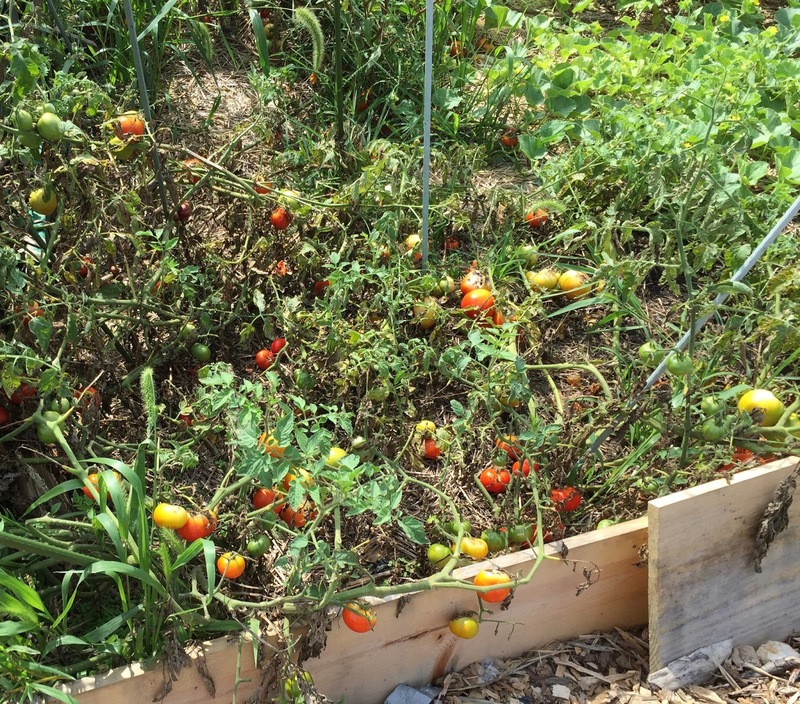 If you do this, it may work best to plant a lot of the same variety of whatever crop you want to preserve, so you’re more likely to be picking it all at once – and consider determinate tomatoes rather than rangy indeterminate ones, so you’ll have an end point to your season. But remember that you can freeze whole tomatoes and then take them out of the freezer later to turn them into sauce. Interested in learning more about food preservation? Contact your local Extension service, or visit our Food Preservation page. By the way, the Specialist approach is also good for anyone who has big sweet corn feasts, since it is not really worth growing corn unless you grow a fairly big patch of it (think 10×10 or more), because of the way it’s pollinated. Do not go minimalist with corn. All right, I need to go process massive amounts of tomatoes now (more on that later, perhaps) but hopefully this was of help to someone! And please do add your thoughts and suggestions in the comments. ← Don’t forget you can pick tomatoes ahead of full ripeness!